Bechtel's mistakes drive up cost overruns, and company profits. State officials overlook and excuse Bechtel's mistakes for a decade. Powerfull allies help protect Bechtel and its bottom line. This series has generated strong response from the state, the public, and Globe columnists. On Feb. 20, 2003, Bechtel/Parsons Brinckerhoff issued a document disputing the findings of the "Easy Pass" series. Globe editor Martin Baron responded with a defense of the Globe's reporting. 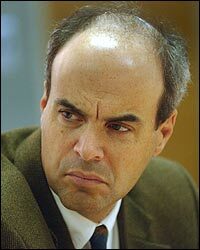 On February 11, 2003, Globe reporter Raphael Lewis chatted with Boston.com readers about the Bechtel series. Any tips? Let us know. n Jan. 26, 2000, state officials convened a high-level meeting to consider whether the Big Dig's managers owed taxpayers a refund for mistakes. The project's budget had ballooned by $1.4 billion, despite public assertions to the contrary. And the managers, Bechtel/Parsons Brinckerhoff, a private, for-profit company, had contributed to the budget crisis through a series of mistakes and misjudgments. Yet when it came time for the Cost Recovery Committee to decide, the officials agreed: No refund. They had never demanded a refund from Bechtel. Created in 1994 to pinpoint design and management mistakes, the Cost Recovery Committee routinely overlooked or excused Bechtel's errors, according to a Globe examination of project records. What made the January meeting really unusual, however, was that it had taken place at all. Until then, the Cost Recovery Committee had not met or taken a single official action since Feb. 2, 1998 -- two years earlier -- records show. Cost recovery "was admittedly never the front-burner issue for me," said Michael P. Lewis, who served as the Cost Recovery Committee chairman as well as the project's state design director. "Perfection was not the standard." he added. Lewis's very involvement in the committee raises questions. As the state's Big Dig design director, Lewis had overseen Bechtel's management of the design phase. To review Bechtel's work meant passing judgment on his own supervision of Bechtel. Lewis now serves as the state's Big Dig project director. Bechtel, too, had a conflict of interest in cost recovery, the Globe found. State procedures called for Bechtel "to identify issues of potential cost recovery," which meant the state relied on Bechtel to point out flaws in its own designs and management. Now, with the federal government unwilling to pay new cost increases in the Big Dig, state officials say they are prepared to pursue Bechtel for the company's mistakes. In 2001, they eliminated the Cost Recovery Committee. It had returned only a single payment of $35,707 in eight years -- and in that case, not from Bechtel but from a smaller design firm supervised by Bechtel. The committee's responsibilities were turned over to state lawyers. But they failed to get back any money after 15 months on the job. So late last month, the Turnpike Authority, which oversees the Big Dig, made another change, handing cost recovery responsibilities to a retired family court judge. Turnpike officials cited a need for an independent review when they hired Edward M. Ginsburg. But the clock is ticking. The statute of limitations prohibits the state from pursuing cases that date back more than three or six years, depending on whether the case is for breach of contract or negligent performance. That means much of the work that went into the Big Dig, including the entire Ted Williams Tunnel, is now almost certainly off-limits to Ginsburg and his staff. What's more, Bechtel spurned a state request in January 2002 to waive the legal limitation on review of all of its work. The company said it would only waive the limit on individual cases. To recover anything at all, Ginsburg must overcome the state's poor record-keeping. No neat summary of design and management problems exists. And the state never kept a running account on Bechtel's performance, either. In 1997, the state decided to evaluate Bechtel every six months, but quickly dropped that initiative, the Globe found. So Ginsburg must start from scratch -- plowing ahead with little experience in construction law and no knowledge of the Big Dig's long and complicated history. Peter Pendergast, the former Turnpike Authority general counsel who arrived at the agency in the wake of the 2000 cost overrun scandal, said he was startled by the project's flimsy records and the conflict of interest of those involved in cost recovery. "Cost recovery was a process that appeared as though it was designed to fail," Pendergast said. "The numbers speak volumes about the effectiveness of the program," he said, noting the committee's record of only $35,707 in refunds. The state's contract with Bechtel was fundamentally flawed, effectively rewarding the engineering behemoth for delays and overruns. Because the state pays Bechtel on an hourly basis, rather than setting specific prices for various jobs, Bechtel will receive more than $2 billion by the time the project is completed, including about $180 million in profit. Before all of the delays and cost overruns, Bechtel was projected to receive a much more modest $350 million in gross receipts and roughly $38 million in profit. Faced with thousands of cost overruns potentially tied to its own work, Bechtel referred just three to the Cost Recovery Committee for further investigation, according to records. On 12 other occasions, the state or the federal government initiated cost-recovery cases against Bechtel. Meanwhile, the state approved thousands of cost overruns to make up for mistakes or omissions related, either directly or indirectly, to Bechtel's design or management, records show. The Cost Recovery Committee exonerated Bechtel in all 15 cases it considered against the company. On at least two occasions state officials rejected evidence presented to them by an independent specialist that Bechtel mismanagement was at the heart of costly delays. In one instance, a state-hired engineer cited Bechtel for being "remiss" in its management of the design of the Fort Point Channel tunnels in 1992, which fell behind schedule for eight months. But state officials met with the engineer to discuss revising his report. In his final report, Bechtel's management was not faulted at all. In the second instance, the engineer found that Bechtel had failed to make sure that designs for a huge concrete wall were sound. The wall had to be torn down and rebuilt, at a cost of an extra $31 million. Bechtel paid none of it. When Bechtel/Parsons arrived in Boston, trumpeting almost 200 years of construction experience, it cut a unique agreement with the state. In December 1985 the state signed the first of 16 contracts granting the massive engineering firm the power to act as a virtual extension of government. Where standard government contracts keep companies such as Bechtel at a distance, even hiring specialists to oversee their work, state officials envisioned a different approach in Massachusetts. Theirs would be a "very special owner/management consultant relationship of trust and confidence," according to the contractual terms agreed upon by the two sides. But while the state pledged its trust in Bechtel, the giant engineering firm left nothing to chance when it came to making a profit on the Big Dig. According to the company's contracts, the state pays Bechtel's 500 or so employees by the hour, on a "pay as you go" basis. That means that whenever a delay or mistake occurs, Bechtel gets paid for more work, rather than being forced to swallow some of the costs of its errors. Sometimes, the state pays Bechtel engineers at overtime rates to correct its own mistakes, according to project records. Roughly 10 percent of Bechtel's work in its current contract has qualified as overtime. And the state pays some Bechtel employees far more generously than its own workers. Bechtel's project manager, C. Matthew Wiley, makes $290,000 a year, records show, nearly twice the salary of the state's project director, Lewis, to whom Wiley reports. Another 84 Bechtel employees are paid more than $100,000 a year, records show. The state also guarantees Bechtel a minimum 7 percent profit, no matter if the project runs late or over budget. Until February 2001, the guaranteed profit reached 11 percent and even 20 percent for select construction work. The contracts built a firewall around Bechtel's profits. No matter how much money Bechtel's errors and poor decisions cost taxpayers, the contracts capped Bechtel's liability at $100 million. That's less than 5 percent of all the money Bechtel will charge the state for its work. And it's $80 million less than what Bechtel will make in profit. In an interview, Wiley said that Bechtel "performed admirably" to a higher professional standard "than required in our contract." Concerning issues with the quality of Bechtel's work, Wiley said: "We've said a number of times we are willing to comply with the contract. If there are issues, we are willing to discuss them." In defending Bechtel, Wiley said his company's role as project manager has been "frequently misunderstood" by critics and the public. That role, as it relates to cost overruns, is fairly straightforward. When problems arise on construction sites, it's the project manager's job to figure out what went wrong, get the problem solved, and assign blame. Bechtel has acted as the traffic cop at the busy intersection of more than 50 design contracts and nearly 110 construction contracts doing almost $15 billion in work. But because the state also hired Bechtel as the chief designer of the entire Central Artery/Tunnel project, it relied on Bechtel to pass judgment on its own design work. And design permeates every aspect of the Big Dig, from devising traffic plans to choosing the path of tunnels to picking the color of roadside barriers. All bids for construction are based on the designs, which provide step-by-step instructions for building each piece of the project. Thus, almost all construction claims for overruns are based on design problems, usually because contractors claim that their jobs required more work than was set out in the original plans. Bechtel did not do all of the project design itself. The company set the design process in motion with preliminary drawings that comprised about 30 percent of what was needed to build the project. Then, Bechtel turned to smaller firms for design completion, which answered to Bechtel. Bechtel reserved for itself all fundamental design decisions -- the what, where, and how of the project. Bechtel remained involved throughout the process by conducting regular reviews. When construction companies complained of design errors or omissions, Bechtel had a contractual responsibility in its other role as project manager to discover the underlying reason behind them -- a designer's mistake, perhaps, or a flawed work zone survey, according to project officials. It was Bechtel's job to figure out who was at fault for the problem. Indeed, the Cost Recovery Committee's procedures relied on Bechtel "to identify issues of potential cost recovery . . . involving a design professional's performance." During the eight years of the Cost Recovery Committee's operation, more than 10,000 overruns were approved, totaling $1.4 billion, records show. Bechtel reviewed and recommended that the state pay all the overruns. And yet hundreds, perhaps thousands, of the overruns were rooted in missing or incorrect information in the designs process supervised by Bechtel. But Bechtel almost never assigned blame. Despite its contractual obligations, the company only three times flagged a cost overrun that prompted the Cost Recovery Committee to scrutinize Bechtel -- for a potential total of $48,911, records show. In those three cases, the committee voted against asking Bechtel to pay up. As for the work of the smaller design firms, Bechtel referred alleged mistakes by those companies to the committee only 17 times, records show. Of those cases, just one firm, Lin Associates, agreed to reimburse the state for work that had to be done over. According to project records, Lin's faulty design of a temporary road in South Boston cost the state an extra $339,198. Lin settled that claim in 1996 by refunding the state for about 10 percent of the actual cost of repaving the road -- $35,707, records show. That payment represents the total financial accomplishment of Bechtel and the Cost Recovery Committee in finding fault for engineering mistakes. Meanwhile, the design firms have received just under $1 billion in fees, roughly double what Bechtel had estimated at the project's outset. Bechtel itself received $341 million for its design efforts. The company declined to provide a breakdown of that sum to show what portion of its design receipts came as a result of cost overruns. In an interview, lawyer David J. Hatem, who represents both Bechtel and the other design firms on the Big Dig, acknowledged a conflict of interest in Bechtel's judgment of the design firms it oversees. "Their fingerprints are all over the design, all over the review process," Hatem said of Bechtel. "It's rare that you find a design issue that" doesn't in some way trace back to Bechtel. Hatem said that, because the state's cost-recovery efforts to date have been so limited, he has rarely had to defend Bechtel or the other design firms. "Cost recovery has not consumed much of my time," he said. But Hatem said he is girding for a "flurry of activity" as project construction comes to an end and the state shifts its attention to conducting a "lookback." As for the state losing the legal opportunity to pursue cost recovery because of the statute of limitations, Hatem said the state faces a "tricky act" in trying to preserve its rights. "It's something" the state "has to keep its eye on." On at least one occasion, a design firm seemed to exploit Bechtel's dual role to avoid paying for alleged mistakes. When threatened with losing a portion of its fee for an alleged design error, the firm Jacobs Sverdrup sent a June 21, 2000, letter to Bechtel saying that if Jacobs Sverdrup had to pay, it may be "necessary to seek recovery of the fee from other potential culpable parties, which is certainly not in the interest of the project." The other "potential culpable parties" would include, most prominently, Bechtel itself. The case against Jacobs Sverdrup is still pending. A spokeman for the firm declined comment. Kurt Dettman, the Big Dig's chief counsel, said the state must overcome Bechtel's conflict of interest if it ever hopes to recover any money. Since Bechtel employees staff most of the project jobs, "They are the ones who know most of the facts on the project, the ones who made most of the decisions on the project," he said. To pursue a case against Bechtel means calling Bechtel employees to give testimony against Bechtel, he said. "When your prime witness is going to be the party you are going after, that's an issue," he said. "Bechtel is going to protect its corporate interests," he added. "We are going to protect the taxpayer interests. The two aren't always the same." In the early days of the project, the state and Bechtel acted as though their interests were quite similar, if not exactly the same. There was no formal procedure to oversee Bechtel's performance at all until 1994 -- when the federal government insisted that the state create one. Under the threat of losing federal funding, project officials assembled the Cost Recovery Committee. The group -- made up of Lewis, state construction manager Joseph J. Allegro, and Federal Highway Administration project engineer Alex Almeida -- was to meet at lease monthly to scrutinize construction overruns and determine if the public deserved a refund for any errors or omissions, according to committee rules. Lewis now says the chief purpose of the committee was "to assure quality." Recovering costs, despite the committee's name, was not its primary objective, he said. "It was not designed to be punitive," he said. While the state approved thousands of construction cost increases, the committee considered only 15 cases challenging the quality of Bechtel's management of the project, almost always as a "co-target" with one of the smaller design firms Bechtel supervised; in 69 cases, smaller design firms alone were targeted. In the 15 cases involving Bechtel, the committee exonerated the firm each time. Due to its conflicting roles, Bechtel had provided much of the documentary evidence the committee relied upon to make its decisions, records show. From 1994 to the spring of 1997, the group met regularly at the project's South Station headquarters, keeping a record of its actions and cases. But records show that by Feb. 2, 1998, after roughly three years and some 45 meetings, the committee had stopped convening. The period during which the committee failed to meet coincided with some of the project's sharpest cost growth -- $1.4 billion in construction overruns, project records show. None received more than the most routine scrutiny by the state. Lewis, who headed the Cost Recovery Committee, insisted that the group continued to meet after Feb. 2, 1998, but that no records of the committee's actions were kept. He asserted that meetings took place irregularly, informally, with no minutes taken -- and with no actions taken. But the records of Cost Recovery Committee meetings kept by Almeida, the Federal Highway Administration engineer, call Lewis's account into question. Those records show regular committee activity between the group's founding in 1994 and Feb. 2, 1998, including hand-written notes on the margins of meeting agendas describing the committee's actions on specific cases. After Feb. 2, 1998, no cost-recovery documentation exists until the Jan. 26, 2000, meeting. Almeida said in an interview that he recalled informal cost-recovery discussions at the conclusion of meetings on other project business. He acknowledged, however, that recovering costs was secondary to the construction work, and as a result, finding fault for cost overruns suffered from a lack of attention. "I would say we probably were not the most timely that I think we could have been," Almeida said. Pendergast, the Turnpike Authority's former general counsel, attributed the lack of cost recovery to the sense of loyalty that state project officials had for Bechtel after working so closely for so many years. "The state, Bechtel -- you couldn't differentiate," Pendergast said. "It was like a regional high school. The kids are from different towns, but they're all on the same team. It's very human, but . . . the citizens of the commonwealth were not well represented." By appointing Bechtel as both the project manager and chief designer, the state allowed Bechtel to judge its own work, an inherent conflict of interest. In four of the 15 cases against Bechtel, state officials hired an independent specialist to help judge the company's performance. Each time, they turned to a consultant named Philip Helmes, an experienced engineer. But although officials turned to Helmes for guidance, they did not always follow his advice. 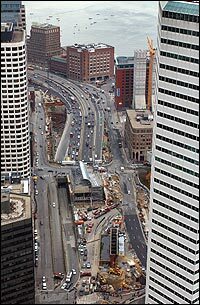 In 1994 the Cost Recovery Committee assigned Helmes to determine fault for a $31 million overrun linked to the redesigning of a 600-foot wall built as part of the Ted Williams Tunnel near Logan Airport. During construction, the wall shifted 8 inches, signaling the potential for a deadly collapse. It had to be torn down and rebuilt. Helmes concluded that the design firm that planned the wall had relied upon incorrect calculations, and that Bechtel had neglected to show the design drawings to its geotechnical specialists. Had the specialists seen the designs, Helmes found, the wall could have been properly built -- and $31 million could have been saved. But the state did not pursue Bechtel. Instead, officials chose to file a claim with the state's insurance carrier, thus avoiding a confrontation with Bechtel. But Bechtel failed to properly manage the insurance claim failed, according to the finding of an arbitrator. Bechtel, in charge of filing insurance claims on behalf of the state, missed the deadline, the arbitrator ruled. The late filing meant the insurance company's adjusters lost the opportunity to investigate the construction site, the insurance company contended. The insurance company paid the state nothing. Bechtel officials declined to comment on the missed deadline or the wall movement. There are no plans to reopen the case. The state also assigned Helmes in 1994 to determine the cause of a delay in the design of the tunnel running under the Fort Point Channel. Bechtel and the firm completing its preliminary drawings, Maguire/Harris, had clashed over the viability of Bechtel's design. And according to Helmes's report, Bechtel, as design manager, failed to take steps to resolve the dispute. Finally, when state officials heard of the dispute, they brokered a deal to end the impasse. But eight months of delay had occurred -- on a project in which each day of delay can cost hundreds of thousands of dollars. In his first report, Helmes concluded that Bechtel had not managed the situation well, "which impaired project productivity." He cited Bechtel, along with Maguire, as "remiss." But project officials did not accept Helmes's conclusions, Helmes said. After a first draft of his findings circulated among project executives, Lewis met with Helmes. Although current and former project officials were tight-lipped about what transpired, Lewis acknowledged "working with" Helmes to help the consultant "look at the facts." What is clear is that eventually Helmes concluded "that all parties" -- Bechtel and Maguire/Harris -- "performed with a reasonable standard of care" on "this very complicated and unique design challenge." Where the report once said that design "was not well managed by Bechtel," it now read: "Solutions could have been developed earlier." Lewis said of Helmes: "I'm quite confident he didn't do anything he wasn't comfortable with." Helmes agreed that he did not feel pressured to change the report. He said he dropped his conclusion that Bechtel was remiss because the state would not agree to his request for more time to investigate further and nail down his preliminary finding. "It was stopped," he said, of his review of Bechtel. "Apparently, they didn't want to spend the money." If the state has any hope of recovering money from Bechtel and the other design firms, it will need accurate, detailed records. But the records compiled by the state are in disarray, the Globe found. Project officials cannot even agree on the status of 13 of the 84 cost-recovery cases the Cost Recovery Committee initiated. State records show the cases as open. Federal records show them as closed, with the usual results: No findings against either Bechtel or the design firms it managed. It's not a small matter whether the cases are open or closed: Those 13 cases alone are worth at least $14.5 million in potential refunds to the state, records show. The cost-recovery files constitute a hodgepodge of memos, tracking forms, letters to and from Bechtel, and financial assessments. Fewer than half a dozen files contain anything resembling a coherent assessment of the facts behind a cost overrun. Many are handwritten, some almost illegibly. The files contain official documents incompletely filled out, others undated. Several files were actually lost and "re-created" by officials in the late 1990s, officials said. Lewis and Dettman said they can't find any documents created by the Cost Recovery Committee to keep track of its cases from 1994 to 1997, and in 2000. Yet copies of those records are on file with the Federal Highway Administration in Cambridge. Dettman, the top lawyer at the Big Dig, helped draft the cost-recovery procedures in 1994. He now says he was dismayed by the committee's poor record. But while Dettman says he complained to the last three Big Dig project directors of the committee's flagging efforts, he acknowledged his internal warnings changed nothing. "We are playing the cards we have been dealt," Dettman said of state efforts to get refunds. "We are going to take it as far as we can. Records get lost, memories fade, people die. There will be defenses available to the other side." The state's heavy reliance on Bechtel to recover money was made clear on Jan. 14, 2000, when Joseph Allegro, the state construction manager, made an eleventh-hour stab at recouping costs, three weeks before officials disclosed the $1.4 billion cost overrun. In a brief e-mail, Allegro ordered eight engineers to scour their files for evidence of past mistakes by Bechtel or the smaller design firms under Bechtel's supervision. Three of the eight engineers addressed by Allegro worked for the state, but the other five belonged to Bechtel. "Don't spend a tremendous amount of time," Allegro wrote. "This is not to second-guess anyone's judgment, but to simply ensure nothing fell through the cracks." Allegro got the results he might have expected: No new cases against Bechtel. Now, as the Big Dig drags to completion, with more than two years to go, the state is showing greater interest in recovering money from Bechtel, even though the statute of limitations may cut off refunds on overruns dating back to the project's first 11 years. Still, Lewis suggested the state could get around the statute in some cases by claiming it should not apply to contracts that are still open, no matter how long ago the individual overrun occurred. "I do feel very strongly we need to do an assessment of Bechtel," Lewis said. "I think we can still assess the whole record." But Dettman, who led cost-recovery efforts until Ginsburg's appointment, said the difficulty of overcoming the statute of limitations makes review of some Bechtel errors pointless. "We're not going to spend a whole bunch of time" on old cases, he said. The Cost Recovery Committee, which met only three times in 2000, had its last official meeting on Feb. 26, 2001, records show. Some 250 cost-recovery cases have opened since November 2000, the vast majority of them involving potential claims against the smaller design firms that completed Bechtel's drawings. Still, Dettman insists that Bechtel is a target in every one of them. "We're going to treat Bechtel like any other contractor," he said recently, before cost-recovery responsibilities moved to Ginsburg. Bechtel is hanging tough. The company refused to sign an agreement to stop the statute of limitations clock from ticking down on its work, except in three cases. Instead, it has forced the state to quickly compile detailed cases involving allegations of Bechtel errors or mismanagement. "We're playing a massive game of catch-up," Dettman said. To help the state, Dettman hired consultants to sift through what remains of the evidence. Their primary job, he said, was to find cost overruns that have yet to expire. After that, they were supposed to figure out if the state has a strong enough case to warrant pursuing Bechtel. The consultants hired by Dettman have cost taxpayers more than $6 million so far -- without returning a penny. But no review undertaken at this late date will turn back the clock on the thousands of overruns from the project's earliest years, Dettman acknowledged. Asked how many cases against Bechtel may have been missed through the years, Dettman replied: "I don't know. I don't think anyone knows." Globe reporter Thomas C. Palmer Jr. contributed to this story. Sean P. Murphy can be reached by e-mail at smurph@globe.com. Raphael Lewis can be reached at rlewis@globe.com. This story ran on page A1 of the Boston Globe on 2/10/2003.